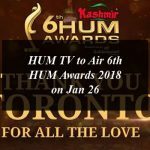 HUM TV To Air 17th Lux Style Awards 2018 On April 22. The Lux Style Awards is the biggest award ceremony held once a year in Pakistan since 2002. Lux Style Award is one of the most prestigious awards in Pakistani showbiz industry. The 17th Lux Style Awards 2018 was a fun filled event with glittering celebrities and also carrying many colourful and memorable performances by actors and actresses. HUM TV is all set to air the 17th Lux Style Awards 2018 on Sunday 22nd April in Pakistan. The Lux Style Awards 2018 were on 20th February at Expo Centre Lahore. The award ceremony was attended by the number of glittering celebrities, models, and people from the fashion and entertainment industry dressed to impress the audience. You can watch the 17th Lux Style Awards 2018 on 22nd April on Sunday only on HUM TV at 8:00 PM. For more information and full show click here.